The new owner of Peacocks said he hopes to reopen 75 of the clothing chain's 224 stores, which had closed. Philip Day, chairman of Edinburgh Woollen Mill (EWM), said he wanted to "save as many jobs" as he could. 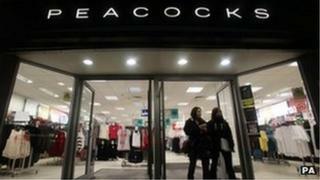 The retail tycoon also hoped to rehire around 80 staff who were made redundant from Peacocks' headquarters in Cardiff. EWM bought the retail chain out of administration last Wednesday but more than a third of its UK workforce lost their jobs. EWM saved 6,000 posts but 3,100 were made redundant. The deal included 338 stores, 57 concessions, three distribution centres and the head office. But 224 stores across the UK were closed immediately after the sale announcement. In an interview with the Sunday Times, Mr Day revealed he was in talks with landlords in an attempt to reopen some of the unprofitable stores that were not part of the deal. "A lot of the 244 stores that closed were blindingly unprofitable so we don't want to reopen those, but if we get the right sort of deals we could reopen 75 of them," Mr Day said. "We will look to go to monthly rents and get a rent reduction. If we can get new lease deals, we'll try to reopen those shops." Mr Day said he was hoping to rehire about 80 staff from the Cardiff office, where 250 people lost their jobs when administrators were appointed and another 16 were made redundant last week. "We need to rebuild the team. I would like to save as many jobs as I can - the economic situation is bad enough and we could do without more people going on the dole," he said. Peacocks collapsed under a mountain of debt in January in the biggest retail failure since the collapse of Woolworths. Mr Day has created one of the UK's biggest High Street groups and earned a reputation of turning around troubled companies. It bought 77 stores from the administrators for textiles business Rosebys in November 2008 and they were merged with the assets of furnishings business Ponden Mill to create the 150-strong Ponden Home chain. And last summer it bought the Jane Norman fashion brand and 33 stores from administration.